I am always looking for nautical bedding. This may come as a shock but I have non-nautical sheets on my bed! I just haven't found the perfect sheets yet. Rare to find nautical bedding during fall and winter so stock up now! I have the Garnet Hill sand dollars--love them! 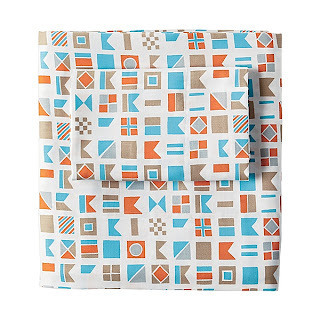 I LOVE that Modcloth duvet cover! I'm loving this for a beach house! Oh my gosh, I think I have finally met my blogger match... I never thought it would be possible for someone to love nautical as much as me :) But seriously though I've been searching for nautical bedding (something other then just an anchor or sailing flag throw pillow or two) forever. This blog post as saved me, cause I was just about to admit defeat. Anyway love this post and your blog! Let me know which sheets you end up getting!